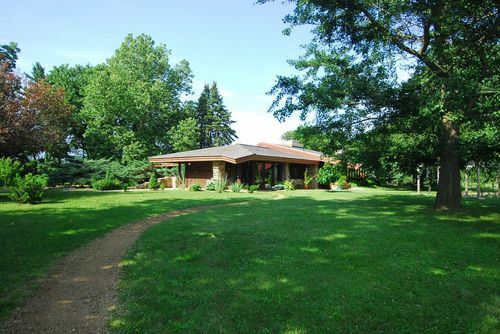 Meticulously restored 1962 Frank Lloyd Wright style organic Usonian mid-century modern home on 2 acres in Polo, IL. $300K in recent updates including new concrete floors with radiant heat, new cypress roof, new electrical, new plumbing, new insulation, new windows, new appliances and much more! Heating costs average $100 per month in the winter. The 2500 square foot home rests on a tranquil 2 acre lot in a quiet prairie town surrounded by evergreen trees, an heirloom fruit tree orchard, 1/4 acre organic garden and a 500 square foot heated studio/office space. As The Journal Standard wrote in 1962: "It is called organic because it seems to be born of its surroundings, a perfectly correlated harmonious whole of stone, cedar, and glass; and because of its expressive flow of continuous surface wherein walls, ceilings and floors seem to filter in to one another...Now that the dwelling is there, one imagines that the occupants will take root and grow with it."